No matter what type of job you have some level of workplace stress is inevitable. In fact, many people report that their job is the main source of stress in their lives. This can lead to physical problems, like fatigue, headaches, hair loss and digestive problems, in addition to creating a sense of anxiety and heightened emotional responses. 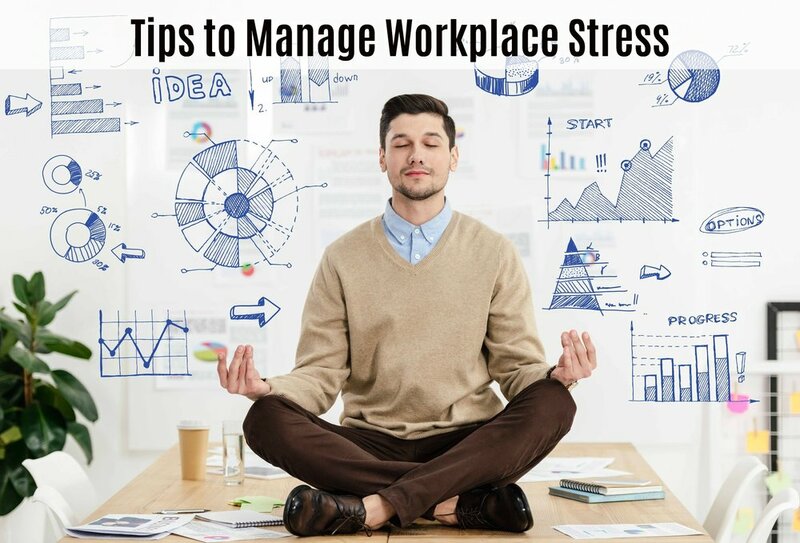 While work may sometimes feel like a never-ending struggle, take a deep breath and remind yourself that the key to preventing stress during the workday is to get a handle on it before it takes control of you. Although the specific causes of workplace stress may vary, one way to reduce it is to leave it behind. Or, as it’s commonly explained, “leave work at work.” For some, work is all-consuming. You take it home with you in the form of extra paperwork and reports or staying connected to email via your phone. How do you have any time to yourself when you’re devoting it all to your job? When you can’t unplug from work, your personal life gets put on the back burner. When you get the urge to bring work home or answer just one more email before dinner, stop. Hit pause and take a moment to consider how it will impact your free time. It seems innocent enough to answer one email, but one email can quickly turn into two or ten. Taking care of yourself while you’re at work can help keep stress at bay. Avoid eating foods that are high in sugar during the workday. Sure, you get that boost of energy but it doesn’t last and it can mask the stress you already feel. When the inevitable crash hits you’ll feel worse than you did at the start. Make an effort to relax by using your break times to find some inner peace and quiet. There are numerous apps designed to help you relax – most are free and take less than 15 minutes to practice. If you don’t want to go digital for relaxation, take a yoga break, or simply get outside for a few minutes. A quick stroll, stretching, or moving about can bring back some balance. Your body stiffens, your neck and shoulders feel strained. Ugh, you’re so uncomfortable. While the physical strain on your body may be the result of poor posture, it may also be a reaction to a stressful situation. Sometimes the body speaks for the mind. As mentioned above, a walk or moving about can help. So can the LeanRite, our standing desk stool that lets you sit, stand, lean, and perch so that you can move throughout the day even if you can’t leave your desk. The LeanRite offers several positions that promote good posture, which can help relieve tension in your neck, back, and shoulders, where stress is often felt the most. You can sometimes remove a chunk of workday stress by communicating your needs to your teammates. That might mean clarifying expectations and deadlines or asking for help on a pressing issue. Co-workers may be able to offer insight on a frustrating task or show you where to find the resources you need for a project. There’s a reason there’s no “I” in TEAM; no one expects you to do it all yourself all the time. Reducing stress might mean a simple conversation with your boss. They can’t help you if they don’t know what the issue is. If a specific problem is causing you stress, present a couple of potential solutions that he or she can help you implement. A good supervisor will help you prioritize, educate you on workflows, and make sure that you’re aware of people and resources available to support you. Who knows, you may not only relieve your own stress but help institute a new way of doing things that the whole office can benefit from. By identifying the triggers that bring you the most stress, taking good care of yourself, finding support, setting boundaries, and moving more throughout the day, you can combat stress before it gets out of control.